The LG Nexus 4 just returned to the Google Play store after both capacities sold out roughly two weeks ago, but now it looks as though the 16GB version will only be available for Christmas. The 8GB smartphone now has a “4-5 week” shipping notice, where as the 16GB has “1-2 weeks”, so those who want to grab this Android device as a gift for the holiday season had better hurry now. Both the 8GB and 16GB models will likely sell out again or at the very least experience more shipping delays. As seen in the screenshot gallery above, both pages for the Nexus 4 now sport a “Ships Soon” banner with details about when the device should arrive. Google made the Nexus 4 and Nexus 10 available to customers in the United States through Google Play on Nov. 13. 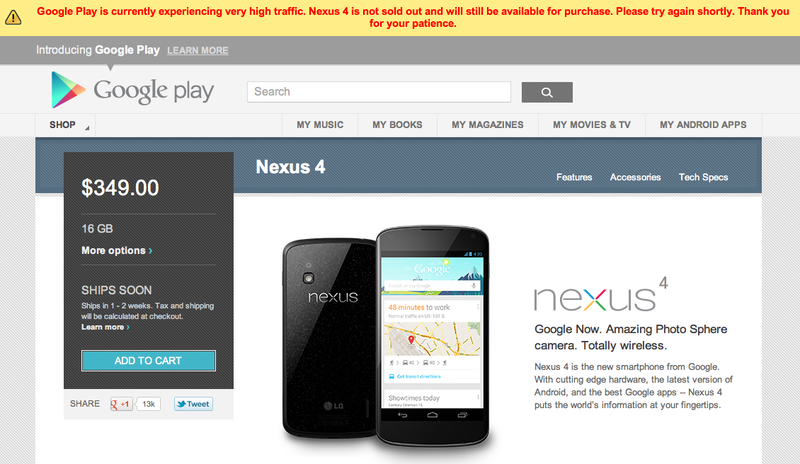 Like the U.S. variant, the United Kingdom’s Nexus 4 also sold out within 30 minutes of going live earlier this month. Check out 9to5Google’s hands-on review of the LG Nexus 4 smartphone for a full breakdown of specs. UPDATE: Google just alerted customers that both capacities for the LG Nexus 4 are not sold out, despite many regions reporting otherwise, with a banner atop of Google Play (see screenshot above).